This 51-unit Leavenworth hotel spread out on 2.5 acres is privately owned and operated. The hotel is located just 2 blocks from the Bavarian village center. Translated from German, “Der Ritterhof” literally means “The Knight House,” which makes our 25-foot-tall Knight the perfect symbol for our charming Bavarian-style hotel! “The Big Guy,” as the long term hotel owner late Fred McClaskey use to affectionately calls him, is about 20 years old and made from galvanized steel and old car parts. He dutifully stands guard over our guests each night, adding to the character of our independent hotel and ensuring your experience is unforgettable in the best of ways. He gets a summer bath about every three years, which is an extra bonus for curious guests! 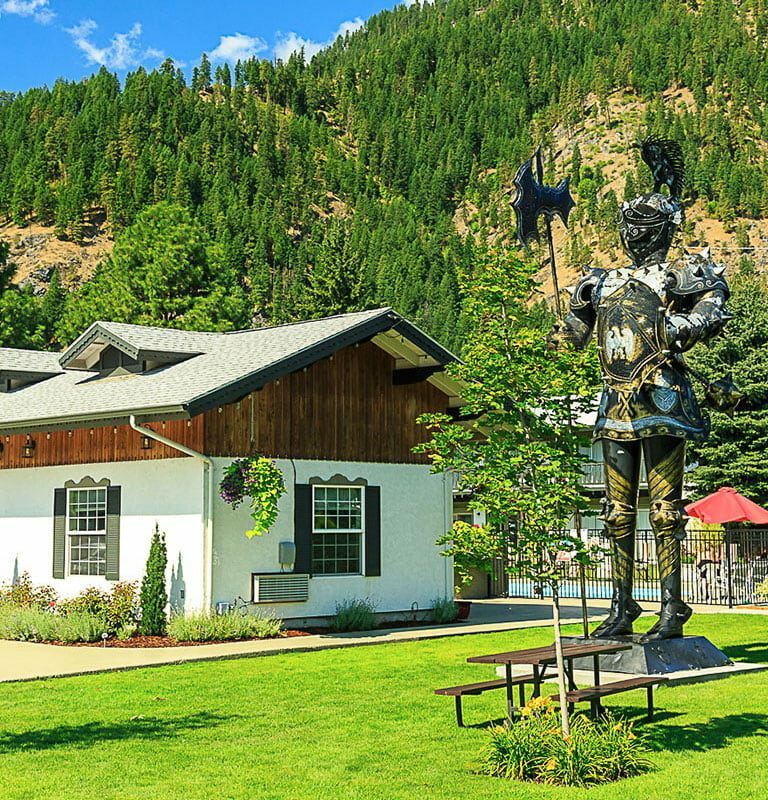 This shining Leavenworth, WA, landmark is pretty hard to miss, even from the highway, and his impressive presence has even earned him his own hashtag at #DerRitterhof. Visit us today to see him up close and personal, and experience the Der Ritterhof Inn for yourself: Book online today or contact us to ask about our group/family reunion rate deals! We’ll see you in Leavenworth! 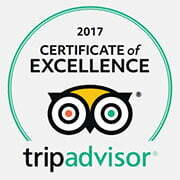 We strive to provide our guests with an exceptionally clean, safe, and friendly hotel experience. The following Hotel Policies / House Rules have been established based on industry standards, management and operational procedures, and our personal experience of owning and operating hotels since 2000. These Hotel Policies / House Rules are considered a part of our reservation agreement with you. As our hotel guest, by reading and signing your hotel registration you are agreeing to abide by all of our Hotel Policies / House Rules, terms and conditions, and procedures, and we reserve the right to make a charge to the guest’s credit card if any fees are assessed for damages or not complying with Hotel Policies / House Rules. As a small independently owned and operated business hosting thousands of guests a year, it is important to be upfront and consistent with our policies so that all guests are treated in a fair and like manner. We've prepared these Hotel Policies and House Rules to help promote our guests' safety and enjoyment and to ensure that each guest is aware of the understandings between the Der Ritterhof Inn and the guest. FRONT OFFICE HOURS: Our Front Office is open 24 hours a day. CHECK-IN TIME: Check In time starts at 4 pm. 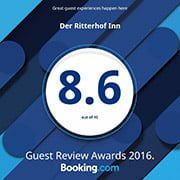 CHECK-IN REQUIREMENTS: Guests must be at least 18 years of age to check in at the Der Ritterhof Inn. In the interests of security and to prevent fraud, guests are required to confirm their identity by providing their valid government-issued photo identification (State driver’s license, passport, etc.) at check-in. A valid signed, and pre-approved credit card in the name of the guest registration is also required. It is your responsibility to fully understand the manner in which your bank processes pre-authorizations and charges to your credit/debit card. Some banks hold pending authorizations for up to 30 business days. GUEST REGISTRATION: We require valid contact information from the guest making the reservation including first and last name, address, phone number, email, and signature. The total number of guests staying in a guest room must be disclosed when booking a room and declared upon check-in process. PRE-AUTHORIZATION AT CHECK-IN: We require pre-authorized of credit cards/debit cards at check-in. A pre-authorization is a temporary hold of a specific amount of your available credit limit balance placed on your credit/debit card for the full amount of your intended stay plus tax. All credit/debit cards are pre-authorized at check-in. Pre-authorization is not a charge to your account, it is a hold on those funds. Once your actual charge is posted at check-out it can take anywhere from 24 hours to 30 days for the original pre-authorization to be removed by your bank. Generally, most banks release the hold within 3-5 days. It is your responsibility to be aware of how your bank handles all of your transactions, including pre-authorizations. We are unable to remove pre-authorizations directly through our hotel. PRE-PAID 3RD PARTY RESERVATIONS: A Valid credit/debit card is required on all the online 3rd party pre-paid reservations. We reserve the right to authorize $100 for incidental charges on all the pre-paid reservations. Authorization is not a charge to your account, it is a hold on those funds. Once you check out from the hotel it can take anywhere from 24 hours to 30 days for the authorization to be removed by your bank. Generally, most banks release the hold within 3-5 days. It is your responsibility to be aware of how your bank handles all of your transactions, including authorizations. We are unable to remove authorizations directly through our hotel. PAYMENT: All reservations and registration must be guaranteed with a valid major credit card. We accept Visa, Master Card, American Express, and Discover Card. Pursuant to credit card agreements, credit cards are not valid unless signed by the cardholder. Credit cards must be signed. Cash (USD) payment is welcomed with a signed and pre-authorized credit card or a $100 refundable cash deposit. All guests are required to present a government-issued photo identification even if guests are planning on paying in cash upon check-in. Gift cards, Checks, and foreign currency not accepted. RIGHT TO REFUSE SERVICE: The Der Ritterhof Inn is privately owned and operated. We reserve the right to refuse service to anyone for any reason(s) that does not violate Federal or State laws. The Der Ritterhof Inn has a zero-tolerance policy in which we will refuse to admit or refuse service or accommodation in our hotel or may remove a person, without refund, who refuses to abide by the reasonable standards and policies established by the State of Washington and the owners for the operation and management of the hotel. The Der Ritterhof Inn will refuse service or evict a guest: for refusal or failure to pay for accommodations, is under the influence of alcohol, drugs, or any other intoxicating substance and acts in a disorderly fashion as to disturb the peace of other guests or is not in compliance with state liquor laws; acts in a disorderly fashion as to disturb the peace of other guests; is unable to properly supervise their children at all times, seeks to use the hotel for an unlawful purpose; seeks to bring into the hotel: an unlawfully possessed firearm; or something, including an explosive or hazardous or toxic substance, that is unlawful to possess and that may be dangerous to other persons; destroys, damages, defaces, or threatens harm to hotel property or guests; causes or permits persons to exceed the maximum allowable occupancy of room, refuses to abide by the reasonable standards or policies established by The Der Ritterhof Inn for the operation and management of our hotel. SPECIAL REQUESTS: We will make every effort to honor special requests such as a specific floor or room number, adjacent rooms, etc. upon your arrival. All special requests are noted on reservations and we will do our best to accommodate. However, the availability of these items cannot be guaranteed in advance. SEASONAL OUTDOOR SWIMMING POOL: Our swimming pool is open seasonally 9 am -9 pm (Pool is closed during the winter months). Swimming Pool is typically open from the Memorial Day weekend in May to end of September (weather permitting). ALCOHOL POLICY: Registered guests of legal age who choose to bring their own alcoholic beverages must consume those in their room only. Alcohol is not allowed in public areas such as the lobby, swimming pool area, parking lot, outdoor common areas, etc. QUIET TIME: Hotel quiet hours start at 10 pm for the benefit of all our guests. if you become aware of a disruptive guest, please contact Front Desk staff immediately by text, phone or in person. Voices or other devices must be kept at a respectful low level at all times. FREE HOT BREAKFAST: Served daily 7 am- 10 am in the lobby area. CHECK OUT TIME: Check out is at 11 am. Please check-out with the Front Desk so that housekeeping may begin cleaning your room as soon as possible. If you require a later check-out, please contact the Front Desk prior to the day of your departure and we will do our best to accommodate your request. A charge may apply for late check-out. EARLY DEPARTURE: Guests who check out of the hotel after 11:00 a.m. and prior to their scheduled departure date are subject to an early departure fee of one night, plus tax. PETS: Pets are allowed only in the designated pet-friendly rooms. Pet fee is $ 20 per pet per night. Pet(s) must be declared at check-in otherwise a fee of $150 will be charged for any un-declared pet found in a guest room. (please read our policy in the Pet Policy section below). FREE Wi-Fi ACCESS: Access to our Wi-Fi is free for our registered guests. EARLY CHECK-IN: Early check-in is offered based solely on availability. GUARANTEED ROOM TYPE: At Der Ritterhof Inn, we guarantee the type of room you book; however, we are only able to guarantee a room type, not a specific room number or floor. If you specifically need room on the ground floor or need a pet-friendly room, please call the hotel directly, and we will do our best to accommodate that request based on availability. DAILY ROOM RATES: Rates are quoted in United States currency, plus tax. Rates may increase without notice. Rates as advertised on the Der Ritterhof Inn website or any other website or promotional material are subject to change at any time and may increase or decrease at the hotel’s discretion. All room rates are based on double occupancy and are determined by dates requested, room type, and availability. Children age 12 and under can stay free of charge at our hotel when sharing a room with at least one paying adult. Each additional person in room age 13 or older is an extra $10 per night. All rooms are subject to state and local taxes. All confirmed reservation rates are guaranteed. CONFIRMED RESERVATIONS: We will issue you with a confirmation number when a booking has been made. The confirmation number is proof that we have accepted your booking. No booking shall be binding on The Ritterhof Inn until we issue you with a confirmation number. We reserve the right to cancel or modify reservations where it appears that the reservations contain or resulted from a mistake or error. NO- SHOWS: If you do not arrive at the hotel on the scheduled date of arrival, you will be deemed to be a ‘no show’ and your booking will be canceled, and you will be charged a no-show fee equal to the first night stay total. No-Shows during the Ice Fest in January, Octoberfest weekends in October, Christmas lighting festival weekends in December and the last two weeks of December are subject to a no-show fee equal to the entire stay amount. CANCELLATION POLICY: For most reservations, our standard cancellation policy is 72 hours (3 days) before arrival. Reservations canceled within 72 hours of arrival are subject to a cancellation fee equal to the first-night room charge plus tax. Please note that the Ice Fest weekend in January, Oktoberfest weekends in October, Christmas Lighting Festival weekends in December and the last two weeks of December requires 14 days notice before the arrival date to cancel the reservations. Reservations canceled within 14 days of arrival are subject to a charge equal to the entire stay amount. All cancellations must be made by phone; no email cancellations will be accepted. All canceled reservations will be issued a cancellation number. Cancellation numbers are required in the event of a dispute. We will not refund for cancellations made with notice of less than the required number of days. We regret that we cannot make exceptions for personal emergencies, weather conditions or schedule changes as a cause for cancellation. 3rd PARTY CANCELLATIONS: if the reservation was made via Online Travel Agencies (OTA’S) like Expedia.com, Booking.com, Hotels.com, etc. that guest must make cancellation arrangements through the original booking source. As with other reservations, please call them before the cancellation deadline to receive a refund. FESTIVAL & HOLIDAY weekends require 2 Night Minimums: All Festival weekends, major holiday weekends, December 15th -January 5th require a 2-night minimum length of stay unless waived by the reservation agent. There is absolutely no refund for early departures for 2-night minimum stay reservations. FESTIVAL WEEKENDS AND HOLIDAY SEASON DEPOSITS: Reservations for Ice fest weekend, Octoberfest weekends, the Christmas Lighting Festival weekends, December 15th-December 31st require a one-night room plus tax deposit to your Visa, Master Card, American Express or Discover to guarantee your room. The credit card will be charged for the first night plus tax on the day your cancellation period expires. If the credit card we have on file is not valid or has declined at the time we charge your first night plus tax, we will be forced to cancel your entire reservation. GROUP RESERVATIONS: If you book 5 or more rooms for the same night, we will treat this as “Group Booking” subject to Group reservations policy. Group reservations require 14-day advance notice to avoid a cancellation fee equal to your entire reservation. Group Blocks will be held up till 30 days before arrival. Rooms that are not reserved 30 days in advance will be released from group room block. Der Ritterhof will continue to accept a reservation from group attendees after the release date at the prevailing room rate, subject to availability. PRE-AUTHORIZATIONS BEFORE ARRIVAL: To check the validity of your credit/debit card and to guarantee your booking, at the end of the cancellation period the hotel reserve the right to pre-authorize your credit/debit card for the first night's room and tax amount. If the credit/debit card fails to authorize for the first-night stay amount than the reservation will be canceled, and the room will be released back to the inventory. Please note that some debit cards treat authorizations as charges. Please contact your bank with any questions. RESERVATION AND PAYMENT FOR GUESTS BY PRIVATE THIRD PARTIES: Generally, third party payment is not permitted. In the case of paying for a family member if you will not be physically present at the hotel, we require prior completion and approval of a Credit Card Authorization form including a copy of your driver’s license and the front and back of your signed credit card. You must fax these completed documents to the hotel before the arrival of the guest who will be staying at the hotel. You will be responsible for any and all damages and loss. We reserve the right to refuse reservation at any time for any reason. PET POLICY: The Der Ritterhof Inn has a limited number of designated pet-friendly rooms. Advance Reservations are required as pets are only allowed in the designated pet rooms. Only well-behaved dogs are allowed.NO CATS OR BIRDS. Pets(s) must be declared during check-in, and if an undeclared pet is discovered in the guest room, a fee of $250.00 will be charged to the room. We enforce this policy enthusiastically so please kindly declare pet(s) in advance. Pet Fee is $20 per pet per night. Pets are allowed only in designated pet-friendly rooms with prior permission. Limit of two dogs per room. Pets are not to be left alone in the room. No service is provided in pet rooms without the pet owner being present. Guests are responsible for cleaning up after their pet, damages done to the room by their pet, and complaint resolution costs caused by your pet. Guests must sign a pet waiver upon check-in. Under the ADA, a service animal is defined as a dog that has been individually trained to do work or perform tasks for an individual with a disability. Under the Washington state laws, a miniature horse is also considered a service animal. The task(s) performed by the dog or miniature horse must be directly related to the person's disability. According to Washington state laws, it is a civil infraction under chapter 7.80 RCW for any person to misrepresent an animal as a service animal. Under the ADA “do work or perform tasks” means the dog must be trained to take a specific action when needed to assist the person with a disability. For example, a person with diabetes may have a dog that is trained to alert him when his blood sugar reaches high or low levels. A person with depression may have a dog that is trained to remind her to take her medication. Or, a person who has epilepsy may have a dog that is trained to detect the onset of a seizure and then help the person remain safe during the seizure. Service Animals as defined by the ADA are not pets and shall be with their owners at all times. According to Federal Code 35.136(d): Animal under handler’s control. A service animal shall be under the control of its handler. A service animal shall have a harness, leash, or other tethers, unless either the handler is unable because of a disability to use a harness, leash, or other tethers or the use of a harness, leash, or other tethers would interfere with the service animal’s safe, effective performance of work or tasks, in which case the service animal must be otherwise under the handler’s control (e.g., voice control, signals, or other effective means). Service animals must be under handler’s control at all times and may not be left unattended on property at any time. While The DerRitterhof Inn does not charge a cleaning fee, the hotel is permitted to charge the same fee for damages as charged to other guests for any damage to our property or hotel rooms. DAMAGE AND/OR THEFT OF HOTEL PROPERTY: You are liable for any damage howsoever caused (whether by deliberate, negligent, or reckless act) to the room(s), hotel’s premises or property caused by you or any person in your party, whether or not staying at the hotel during your stay. The Der Ritterhof Inn reserves the right to retain your credit card and/or debit card details as presented at registration and charge or debit the credit /debit card such amounts as it shall, at its sole discretion, deem necessary to compensate or make good the cost or expenses incurred or suffered by The DerRitterhof Inn as a result of the aforesaid. Should this damage come to light after the guest has departed, we reserve the right, and you hereby authorize us, to charge your credit or debit card for any damage incurred to your room or the Hotel property during your stay, including and without limitation for all property damage, missing or damaged items, smoking fee, cleaning fee, guest compensation, etc. We will make every effort to rectify any damage internally prior to contracting specialist to make the repairs, and therefore will make every effort to keep any costs that the guest would incur to a minimum. DAMAGE TO ROOM: Damage to rooms, fixtures, furnishing, and equipment including the removal of electronic equipment, towels, artwork, etc. will be charged at 120% of full and new replacement value plus any shipping and handling charges. Any damage to hotel property, whether accidental or willful, is the responsibility of the registered guest for each particular room. Any costs associated with repairs and/or replacement will be charged to the credit card of the registered guest. In extreme cases, criminal charges will be pursued. LOST AND FOUND POLICY: The Der Ritterhof Inn assumes no liability for lost, misplaced, stolen, or damaged valuables or belongings. It is guests responsibly to safeguard their items and valuables. If you discover that you have left behind something of value to you, please call us immediately (509) 548-5845 or email info@derritterhof.com and we will try to assist you in locating your lost item. FOUND ITEMS: The Der Ritterhof Inn is not responsible for any item left behind by a guest. However, any item, with the exception of perishable items, left behind by our guests and found after departure by Housekeeping will be collected, logged in, and kept in a secure location for collection by the owner for up to fourteen (14) days. Reasonable effort will be made to notify the guest that an item has found. Perishable items, underwear, and miscellaneous toiletries are discarded. UNCLAIMED ITEMS/NO CONTACT: Lost & Found items are held for fourteen (14) days while we attempt to contact the guest. If guest contact information is incorrect or cell phone mailbox is full, and we are unable to contact the guest during the fourteen (14) day holding period, the unclaimed item(s) are thrown away, given to local organizations, or disposed of accordingly by The DerRitterhof Inn. NO-SMOKING: Per Washington state law and for the safety and comfort of all, the guest rooms including balconies and patio area are all 100% smoke-free. This includes any kind of pipe, vapor device, cigar, tobacco cigarette or marijuana cigarette anywhere inside the guestroom, balcony or patio. If anyone violates our no- smoking policy a fee of $250.00 will be charged, and the guest will be asked to leave without a refund. This fee is to recover the cost to make your room smoke-free for future guests. We enforce this policy enthusiastically. Guests are encouraged to notify Front Desk staff immediately if they smell cigarette, marijuana, or other objectionable odors. REGISTERED GUESTS ONLY: All guests staying in the guest rooms must be declared and registered during the check-in process. Only registered guests are permitted in the Hotel, other than for brief visits in common areas, no overnight visitors are permitted. Guests shall behave appropriately and with discretion at all times, respectful of the Hotel environment and staff, as well as of other guests. NO-PARTIES IN GUESTROOMS: The Der Ritterhof Inn enforces a No In-Room Party Policy to ensure we can protect the hotel and our guests at all times. No parties, loud disturbances and/or noise-nuisance are allowed or tolerated on these premises. In the event of a disturbance, one polite request (warning) will be given to reduce the noise. If our request is not followed, the guest will be asked to leave the hotel without refund. Registered guest(s) are responsible for all persons visiting. Non-Registered visitors are only permitted until 10:00 P.M. If found with more “people” not listed on the Guest Registration Form after 10:00 P.M. your stay will be considered a party. You will be ordered to vacate the premises without refund and may be assessed a Guest Compensation Disturbance Fee. EXTENDING GUEST STAYS: Current in-house guests must formally reserve/extend their stay as soon as possible. Room availability, including specific/currently occupied rooms, cannot be otherwise guaranteed and should not be presumed. Other guests with confirmed reservations will supersede assumed extensions. All terms, conditions, and payment requirements apply for all extended stays. Rates and fees are subject to change at each renewal. The owners and management of Der Ritterhof Inn are extended the right to deny guest extension requests to any guest for any reason. MINORS THAT ACCOMPANY YOU: You are responsible at all times for the supervision and behavior of any children that are staying with you or visiting you at the Inn and are accountable for ensuring that they comply with these Policies. DO-NOT DISTURB AND ACCESS TO ROOMS: To provide all of our guests with exceptionally clean and safe hotel experience, we provide daily housekeeping. Our Housekeeping Staff will honor the “Do Not Enter” door hanger once during a thirty-six-hour period indicating that the room is occupied. The Housekeeping Staff is required to enter the room at subsequent times to clean the room, check for safety, and verify the condition of the room. Management reserves the right to enter a room with known status of “Do Not Enter” for reasonable purposes, such as an emergency, housekeeping, maintenance, verify that the room, its furnishings, and mechanical equipment are intact, or to address or prevent a violation of our Hotel Policies / House Rules. In the event of suspected illegal activity, management reserves the right to summon law enforcement to aid in eviction. The right to privacy ends when a Hotel Policy/House Rule is broken. Law enforcement will be granted immediate access to hotel property and rooms of evicted guests. CANDLE, INCENSE, ESSENTIAL OILS: Candle, incense, essential oils (diffusing, vaporizing, etc.) are prohibited. These items and activities will be treated like smoking, a fine assessed, and the guest may be evicted with no refunds. COOKING, COOKING APPLIANCES, COMBUSTIBLES, OR FIREWORKS: The safety of our guests, staff, and this facility are extremely important to us. Except for the Kitchenette Suites guests only, preparation of food in other guest rooms by any type of cooking appliances is prohibited. A minimum fee of $150.00 will be charged for cooking in a room, including, but not limited to coffee makers, hot plates, toaster ovens, water heaters, rice cookers, combustible, open flame, barbecue grill, burners, heating appliance, or any other item intended for cooking. HOUSEKEEPING/ROOM INSPECTION: Housekeeping is provided daily between the hours of 9 a.m.-3 p.m. This is a 100 % NON-SMOKING hotel. Rooms are cleaned and inspected daily, and a detailed log is maintained on each room and linen. Rooms are rented to guests in appropriate condition without any prohibited odor. Housekeeping and Front Desk staff are trained and skilled in identifying the odors from prohibited items. If our investigation concludes that you have smoked in your room, cooked, or brought a prohibited item into our facility, fees will be assessed, and you may be evicted without any refund. LINEN CHANGING: Your comfort is very important to us. For guests staying multiples nights, bed linen is changed every other day if all personal items are removed from the bed and our housekeepers can access the walkways around the bed. Housekeeping will be happy to change your bed linens sooner than every other day – please ask the Front Desk for service. We hope our guests will assist us in decreasing our environmental impact and water use by reusing towels as much as possible, however, if new towels are needed, please leave them on the floor of your room and we will replace them. Please contact our Front Desk staff if you have any additional questions or concerns. ENFORCEMENT: All staff is trained and required to respond to potential violations of our Hotel Policy/House Rules. Guests who refuse to abide by the reasonable standards and policies established by The DerRitterhof Inn for the safety of all guests, staff, owners, property and the operation and management of the hotel will be evicted, with no refund. In addition to the room charge, a minimum $50.00 cleaning fee per room will be charged for an infraction(s) of our Hotel Policy/House Rules. PARKING AT OWN RISK: All vehicles are parked at the risk of the owner. The Der Ritterhof Inn shall not assume liability or responsibility for any vehicle, occupants, or contents while operated or parked near the hotel property. IN CASE OF EMERGENCY OR FIRE: Please notify Front Desk in the event of a fire or other emergency. A map that shows emergency exits can be found on the back of your room door located in each guest room. TERMS & CONDITIONS: The Der Ritterhof Inn makes its best efforts to ensure that all the information that appears on its website is accurate. However, no warranty, expressed or implied, is given that the information provided on this website is error-free. The Der Ritterhof Inn does not accept liability for any errors and/or omissions and reserves the right to change the information published at any time and without notice. CHANGES OR MODIFICATION TO THE HOTEL POLICY/HOUSE RULES: The Der Ritterhof Inn reserves the right to amend, modify, change, cancel, vary or add to these Hotel Policies/House Rules or the arrangements and content featured on our Hotel website at any time without prior notice. Please check our website regularly for updates to Hotel Policy/House Rules. Any modification to these Hotel Policies / House Rules that occurs before your departure is considered a part of your reservations agreement with us. A copy of these Hotel Policies / House Rules is located on our website, and available from Front Desk staff upon request.